If you are involved in a sport which involves overhead shoulder activity like tennis, badminton, swimming or sports which involve regularly throwing a ball, then the chances are that you are at risk of shoulder impingement. During my lifetime, I have played competitive levels of badminton, tennis and cricket and have suffered from shoulder impingement on more than a few occasions. Other non-sporting activities that involve overhead shoulder movement like painting or regular lifting might also cause shoulder impingement. While you may have absolutely no chance of throwing down a fast serve or breaking the 100-meter freestyle record, it is not only your sporting prowess that is affected when you develop shoulder impingement. It can also have a painful and persistent effect on everyday activities like scratching your back, getting dressed or buckling up your seatbelt. The usual treatments prescribed for shoulder impingement are anti-inflammatory medications like ibuprofen and naproxen. 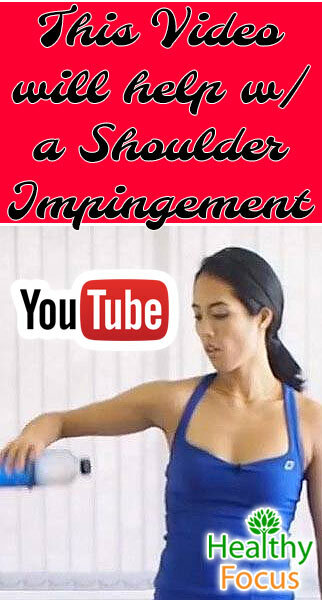 If you are suffering from shoulder impingement syndrome, there is really no quick fix. Recovery time will vary from person to person but there are a number of exercises that you can do to strengthen your shoulder and ease your pain. You can perform these exercises throughout your rehabilitation process and include exercises for mobility and strengthening. Before going on to any exercises, it is important not to perform any sports or activities that are likely to produce more pain. When doing these exercises, make sure that you retain a proper posture. Assuming you are not developing any further pain, you should do these stretching exercises daily during your rehabilitation process and continue to do them even after your symptoms have improved. Click here to see VIDEO of the specific exercise. Either standing or sitting upright, grasp the elbow of your affected arm with your opposite hand just under your chin. Gently pull the arm across the front of your chest and hold for a minimum of 5 seconds. In a standing position, place your forearm against the frame of a door or the wall corner with your arm and hand facing upwards. Lean forward gently and turn our upper body away from your arm in order to stretch your chest muscles. Hold your stretched position for between 20 and 30s seconds and repeat the stretch 3 or 4 times. You shouldn’t feel any pain, only a gentle stretching of the front part of your shoulder. This exercise gently works the back of your shoulder. Put your hand behind you onto the lower back area, just above the waist. Using your other hand, gently pull your elbow forwards while keeping your hand in place on your lower back. You shouldn’t be feeling any sharp pains, just a mild stretch on the back part of your shoulder. Hold the position for 20 seconds and then try to repeat the exercise 5 times so long as you are not feeling any pain. Begin in a standing position with your back straight. Reach the hand of your affected arm over your head and place the hand on your lower neck. Grasp your elbow with the opposite hand and push your elbow backwards gently so that your hand moves down your spine. When you feel a slight stretch in your triceps, hold the position for 10 to 15 seconds and repeat 5 times. Hold onto a doorframe above your head with your affected arm. Gently lean your body forwards allowing your arm behind you to stretch and pull the front of your shoulder and the muscles in the chest. When you feel a moderate stretch in the shoulder, hold that position for some 20 seconds and then repeat the exercise 4 to 5 times. Put the affected arm across your chest and use the other arm to pull it tightly to your body. You should be feeling a slight stretch in the back part of your shoulder but not any pain. Hold this position at least 20 seconds and repeat 4 times. In a standing or sitting position with your back straight, place both hands on the back of your head and then slowly push your elbows backwards until you feel a stretch in your shoulders. Hold that position for 20 seconds and repeat 4 or 5 times. These following exercises are designed to strengthen the shoulder by working on your rotator cuff muscle, which is key to stabilizing your shoulder joint. Like the stretching exercises, it is important not to push your shoulder too much and if you are feeling any pain, you should stop the exercise straight away. Try to do this exercise with a light weight of around 2 to 3kg at first. Lay straight on your side with your affected arm on top. Comfortably rest your head on the opposite hand. Rest your upper arm on the side of your torso with your elbow bent and your hand pointing towards the ground. Lift the weight by rotating your shoulder towards your ceiling as high as you are able to manage. Return your arm to its starting position and aim for between 10 and 20 repetitions. As with the external rotation exercise, use a light weight to begin with. Lay with your body on its side only this time with the affected arm on the underside and your forearm resting parallel with the ground. Lift the weight by rotating your shoulder towards your torso allowing the forearm to move up towards your belly. Gently lower your arm back to its starting position and try to complete between 10 and 20 repetitions. Using a bench or something of similar height, place your hand on the bench keeping your back parallel to the floor. Lift your weight by raising your arm to around chest level then return to the starting position. The motion of this exercise ought to resemble the action of sawing a log. Aim for between 10 and 20 repetitions to start. Stand up straight with your arm abducted to a 90 degree angle and the arm parallel to the ground. Raise your weight by rotating your shoulder so that your hand points upwards towards the ceiling. If you find this exercise a little bit difficult to begin with, you can support your elbow by resting it on the arms of a chair and doing it in a sitting position. The aim of this exercise is to pull your affected shoulder back while keeping your head and arm still. Simple stand up straight and rotate your shoulders backwards making sure that your shoulders are the only part of your body that is moving. It might be easier to perform this exercise without any weights to begin with but once you feel ready, try to incorporate a light 2 or 3kg weight. Aim for 3 sets of 10 repetitions to start off but try building up the repetitions to 20 or 30 when you feel ready.